Dr. Frank Lamm (left), a radiation oncologist at Spokane CyberKnife, has treated about a dozen patients this year. It was tax season. The way accountant Greg Sweeney saw it, there was no way he had the time to skip work for surgery and then see clients with a bandage on his neck. So, against the best wishes of his doctors, he put off treating his skin cancer. "Had brachytherapy been offered, I would have taken it right away," he says. Electronic brachytherapy is a new treatment for skin cancer that offers patients a shorter, knife-free alternative to the common surgical approach. In the oft-used Mohs surgery, doctors remove and examine thin layers of cancerous skin until they've removed all the cancer. They then close the incision and patients are left with downtime and often a scar. Electronic brachytherapy instead uses small amounts of radiation targeted at the spot of cancer. The radiation is administered during eight treatments over four weeks, each taking less than five minutes, and the worst a patient is left with is redness in the area, like a sunburn. Once that heals, some patients will have slight discoloration but most see their skin return to normal. This summer, a few years after he eventually had surgery for the spot on his neck, Sweeney, 55, noticed a small bump on his chest that appeared "literally overnight." This time, electronic brachytherapy was available at his dermatologist's office, and he took advantage of it with quick treatments around lunchtime. "Here I am, I look at it and can't even tell there was anything there," he says. "So I'm very pleased with the results." Treating skin cancer with radiation is not entirely new. Doctors have used electron beam therapy, which requires more treatments and must be done in a lead-lined room (often at a cancer treatment center) to protect staff from "ambient radiation," says Wm. Philip Werschler, a dermatologist at Spokane Dermatology Clinic who also teaches at the University of Washington School of Medicine and lectures across the country. His office started using electronic brachytherapy at the start of 2014. The radiation used in electronic brachytherapy is contained inside the machine, then emitted through a small, metal, cone-shaped applicator. This helps keep the radiation directed only at the cancerous skin, minimizing risk and allowing it to be offered in dermatologists' offices. Because skin cancer often appears in multiple places patients get to know their dermatologists well. And that can make going to a cancer center for radiation a scarier prospect than getting treatment from their dermatologist, Werschler says. "Psychologically, skin cancer patients don't see themselves as being sick," he says of those who have non-melanoma skin cancers, which can be treated with electronic brachytherapy. "They go to a cancer center and... skin cancer patients don't like that environment, and it's not their doctor." Like some other cancer treatments, radiation treatment for skin cancer is orchestrated by a team of doctors. Dermatologists will suggest electronic brachytherapy as a possibility for patients, then meet with a radiation oncologist to determine the dosages of radiation in each session of treatment to effectively get rid of the cancer. In many ways, the procedure seems too good to be true. And in some cases, it is. Electronic brachytherapy can't be used to treat melanoma, the most serious and deadly form of skin cancer. It also can't treat cancerous spots that are too deep or are wider than the largest metal cone on the machine (50 mm). The same goes for parts of the body on which the cone can't fit flatly, like the bridge of the nose or the jawline. 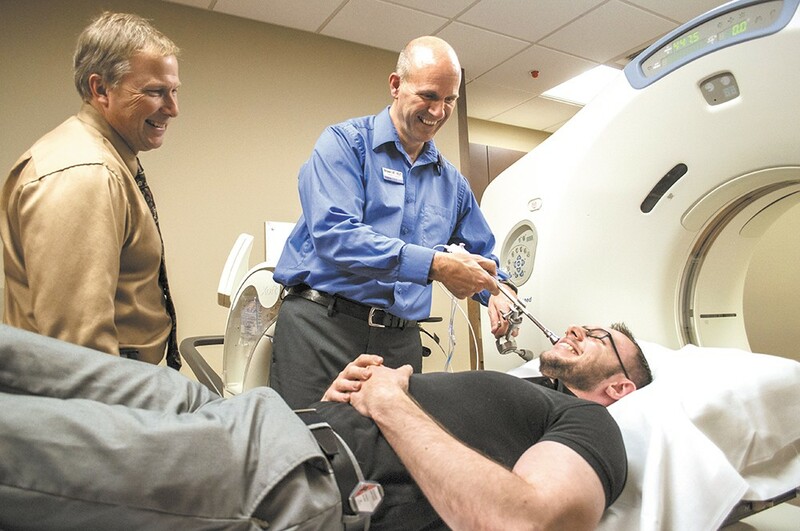 "It's meant to be an option for patients," says Frank Lamm, a radiation oncologist at Spokane CyberKnife, where he's treated about a dozen patients with electronic brachytherapy this year. While the new treatment is easier and quicker, Lamm recognizes the benefit of Mohs surgery is that "you get real-time verification that you got it all." Joann Berger experienced the treatment's shortfalls this year when she had electronic brachytherapy, but then found out it hadn't penetrated deeply enough to get rid of the entire cancerous spot. Berger, 82, has had multiple cancerous spots treated and was surprised by the ease of this new technique, though it ultimately didn't work for her. Soon after, she had surgery on the same spot. "I put my face in their hands," she says with a chuckle. While no new treatment is certain to work for everyone, doctors say electronic brachytherapy is providing an alternative that offers patients real physical and aesthetic benefits. And after a year's worth of results, Werschler says, it appears to be about as effective as other forms of treatment.